Against a backdrop of rebellion and intrigue, love between Javier Carteña, commander of insurgent Mexican forces, and Calypso Searcy, an American novelist at the pinnacle of her career, sizzles with passion across a broad sweep of history. Encompassing time from the Conquest of the 1500s to the present, the story races across space as well, from the forests of Chiapas to the city of Paris. There, an international investigative reporter named Hill picks up the swiftly vanishing trail of Calypso’s disappearance, and unwittingly becomes involved in one of the great dramas of the twentieth century and one of the great love stories of any age. It seems appropriate that I’m posting this review on November 1st – Dia de los Muertos is in full swing in La Paz, BCS, Mexico, where my parents live – and I’m still bearing traces of Halloween glitter as I write this morning. Not that Fiesta of Smoke is a Halloween story – it’s not. What it is is a genre-bending epic that takes us to Mexico in the present, recent past, and ancient past, Paris, and points between. It’s part adventure, part fiery romance, part historical, part political…but in this case the actual novel is much, much, more than the sum of those parts. The three leads move around each other in ways that often reminded me of a Celtic knot, coming together, falling away, their patterns and adventures a great dance through history, geography and passion. Politics, too are involved, and reading this novel while listening to my mother describe the various modern political parties (I think PAN is in power right now), was a bit of a trip. If my description is vague, it’s because it’s so hard to take a 500+ page novel that is beautifully written – and let me interrupt myself here to mention that author Suzan Still’s depictions of food are as tantalizing as her use of language – this book reads like an opera, truly – and condense it into a few paragraphs. 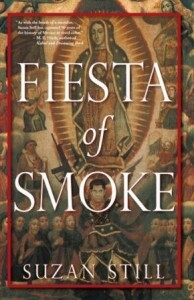 Read Fiesta of Smoke. If you’re not doing NaNoWriMo, read it this month – it’s the perfect November novel – it’ll keep you warm on cold nights, and fuel your imagination on dark mornings. If you ARE doing NaNo, read it anyway. Writers have to read, right? Either way, you will be swept away, as I have. I’m supposed to be spending Christmas with my parents in Baja Sur, but suddenly my itch to go south of the border is stronger than ever. Goes well with: chicken mole, grilled chayote, and Indio beer. Text taken from the author’s website: Suzan Still holds a masters in art and writing and a doctorate in depth psychology. A retired university art professor, she also taught creative writing in a men’s prison, where she became increasingly concerned with issues of social disenfranchisement–as the reader of Commune of Women will discover. She continues to explore this theme in her novel-in-progress, Fiesta of Smoke, which focuses on the coming revolution in Mexico, where she has traveled for over thirty years. As a writer, she favors the novel form but also has published poetry and nonfiction and is an avid journal-keeper. Also, she has led dream groups for over twenty-five years. Her fascination with dreams will be evident to the reader of Commune of Women, while, as an artist, she is delighted to introduce her artwork to the world as the cover image for the novel. 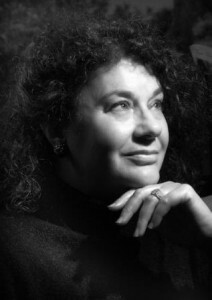 Her interests include painting and collage, sculpting in marble, photography, foreign travel, gardening, cooking, antiques and all things French. Suzan lives in the foothills of California’s Sierra Nevada Mountains on land that her family pioneered, with her husband and an assortment of rescued fur children, who take her for her daily walk in the woods. Special thanks to the folks at TLC Book Tours for giving me the opportunity to read Fiesta of Smoke. Here’s an opportunity for you: the first person to comment on this post can get a copy of Suzan Still’s previous novel Commune of Women. I feel compelled to add: for the average American tourist, Mexico is very safe. Yes, there are “drug wars” but those are mostly around the US/Mexico border, and mostly involved drug cartel members killing each other. Most of Mexico has fewer fatalities in a whole year than major U.S. cities do in a month. Be smart, be aware, but don’t be afraid. Review: Fiesta of Smoke by Suzan Still by Melissa Bartell is licensed under a Creative Commons Attribution-NonCommercial-ShareAlike 4.0 International License. Perfect timing for this post for sure! I’m so excited to get my hands on a copy of this book and dive right in.